President-elect Donald Trump will name Exxon CEO Rex Tillerson as secretary of state Tuesday morning, sources tell CBS News. Mr. Trump said on Twitter Monday evening he would make the secretary of state announcement Tuesday morning. His search for the country’s top diplomat stretched out in a highly public fashion for weeks. Mr. Trump had been considering former Massachusetts Gov. Mitt Romney, once a vocal critic; Sen. Bob Corker of Tennessee, who leads the Foreign Relations Committee; and Tillerson, who met twice with Mr. Trump during the past week. The 64-year-old executive has no government experience, but he heads the largest oil company in the world. It operates in dozens of countries -- including Russia, which has sparked controversy recently for the Kremlin’s alleged involvement in the U.S. elections -- and has oil and natural gas interests on six continents. 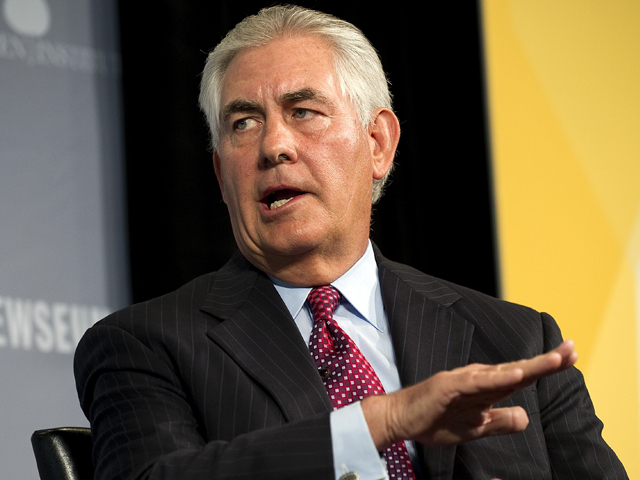 Tillerson began his career at Exxon in 1975 as an engineer. (He graduated with a civil engineering degree from the University of Texas in Austin). Eventually, he worked his way up through the ranks to become president and joined the board of directors in 2004. He was made CEO two years later. Tillerson faces some obstacles ahead. He has one deal in particular that could prove problematic during Senate confirmation hearings: Exxon’s deal with Russia to drill in the Arctic Ocean. Tillerson and Russian President Vladimir Putin met in the 1990s when Tillerson was Exxon’s man in Russia during Boris Yeltsin’s presidency, and Putin was Yeltsin’s up-and-coming KGB operative with an eye toward Russian economic revitalization. In 2011, Tillerson negotiated Exxon access to drilling rights in the Arctic. As part of the deal, Russia’s state-owned oil company, Rosneft, became an investor in Exxon global operations, specifically concessions. At Putin’s behest, Tillerson was given the Order of Friendship in 2013. Tillerson spoke in general terms against economic sanctions imposed on Russia by the U.S. and European Union after the incursion and subsequent seizure of Crimea in Ukraine. John Hamre, president of the Center for Strategic and International Studies, where Tillerson is a board member, told the Wall Street Journal recently that the Exxon chief has had significant contact with the Russian president. “He has had more interactive time with Vladimir Putin than probably any other American with the exception of Henry Kissinger,” Hamre, who was also a former deputy defense secretary under President Clinton. Questions about Tillerson’s attitude on these sanctions during confirmation hearings would be complex by themselves. But they may grow even more heated in light of Tillerson’s 2.5 million shares of Exxon stock (1.8 million of which are not vested and cannot be sold now) and what Tillerson would do to eliminate potential conflicts of interest. There is also the issue of Exxon and climate change. Tillerson himself is not a skeptic and has called the threat “real” and “serious.” But Exxon’s role in submerging scientific evidence about the role fossil fuel burning played in climate change -- evidence Exxon itself invested in learning about and confirming before a scientific consensus emerged -- could prove politically damaging. Exxon has bitterly denied the charges and faulted the Rockefeller Family Fund for divesting from ExxonMobil stock (A 2015 series of articles in InsideClimate News alleged Exxon knew of the link as far back as 1977). The revelation has prompted an online petition #Exxonknew for a federal investigation.